Dieppe hatched at a cliffside nest on Mont St-Hilaire in late May, and took flight for the first time around the beginning of July. He was captured on August 2, at which time he was banded and fitted with a 20-gram satellite transmitter. Dieppe is named after the cliff overlooking the town of St-Hilaire, where the peregrines have traditionally nested over the past decade. He becomes the second cliff-raised peregrine to be monitored through Project Track-'em. Below is a summary of Dieppe's travels during the two months he was under observation. Oct 15, 2001: location unknown. More than three weeks have passed since we last received a signal from Dieppe's transmitter. This is particularly surprising since the last report we did receive contained a number of very strong signals. Usually when we lose communication with one of the Project Track-'em birds, premature failure of the battery transmitter is one of the explanations considered. But since the signals were so clear on the last day of transmission, it seems unlikely that this is the case for Dieppe. Another possibility is that the transmitter has fallen off and landed in a place where it cannot communicate with the satellite (e.g. underwater). We design the transmitter harnesses so that they will fall off on their own after approximately 12 months, to ensure that the bird won't be wearing a dead transmitter indefinitely (in the case that we are unable to recapture the bird to remove the transmitter). However, it is a fine balance to stitch the harness in place such that it holds tight, yet eventually breaks. While we have developed and tested a method which is successful most of the time, it is certainly possible that depending on slight variations in application, in bird behaviour, or in environmental conditions may alter the life expectancy of the stitches. While it would be surprising for the stitches to break down after only two months instead of twelve, we cannot rule out this possibility since we don't know what circumstances may have been involved. The third option to consider is that Dieppe has died. He has been frequenting wild areas where Great Horned Owls are common, and already this year in Ontario we know of three juvenile peregrines which have been preyed upon by Great Horned Owls. However, an owl surely wouldn't eat the transmitter, and therefore in theory it should continue to transmit signals from a stationary location after such an incident. Of course there are other possible causes of death, but most would similarly not be a cause for the transmitter to stop broadcasting. An exception would be if Dieppe was involved in a collision with a vehicle of building in which the transmitter itself might have been damaged - but in such situations we would expect to hear from people who witnessed the crash or found the body, and this has not happened. While none of the three scenarios above seem very likely, our experience suggests that one of them is likely close to the truth. If we receive no further reports from the transmitter, it will likely be difficult to resolve the situation any further. However, we remain hopeful at this point that we will get another signal eventually and/or that someone will contact us (marcel@peregrine-foundation.ca) with news of Dieppe. Oct 3, 2001: location unknown. Dieppe's last two transmission periods have produced no reports. Hopefully this is just a temporary situation, and we will resume getting updates from him soon. Sep 21, 2001: 45.4N, 75.6W (Ottawa, Ontario). While it appeared that Dieppe was about to head back into the United States, he has instead turned around and headed back north again. We received a series of reports from him today, with the strongest and clearest placing him in the Mer Bleue bog just east of Ottawa. Sep 16, 2001: 44.4N, 75.9W (Mallorytown, Ontario). Dieppe is on the verge of crossing back into the United States for a third time. He spent today on the north shore of the St. Lawrence River in the Thousand Islands region near Mallorytown. Sep 12, 2001: 45.0N, 75.3W (Winchester, Ontario). Dieppe has reversed himself slightly, and is now again near Winchester, Ontario. Sep 7, 2001: 45.1N, 75.4W (Vernon, Ontario). Since his last report to us four days ago, Dieppe has inched slightly to the northwest, moving roughly 15 km closer to Ottawa. His location as of tonight is near the small town of Vernon along Highway 31. Sep 3, 2001: 45.0N, 75.3W (Winchester, Ontario). Sure enough, Dieppe has again quickly rejected what New York State has to offer! This time he headed almost straight north from his last reported location, and is now near the village of Winchester, roughly 50 km southeast of Ottawa. Aug 29, 2001: 43.8N, 75.3W (Lowville, New York). 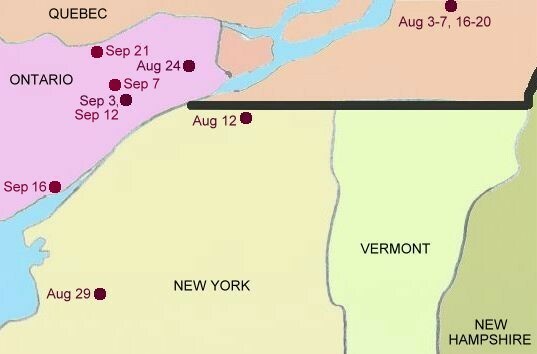 For a second time, Dieppe has crossed the border into New York State. This time he has gone considerably further than on his first venture into the United States. He is now located just east of the small town of Lowville, New York. This is approximately 80 km north of Utica, New York, and 100 km south of Brockville, Ontario (and 240 km southwest of St-Hilaire). Aug 25, 2001: 45.3N, 74.6W (Alexandria, Ontario). Dieppe has crossed a different border this time, and is now in Ontario. His final location today was close to the town of Alexandria, roughly 60 km west of Montreal. Aug 20, 2001: 45.5N, 73.2W (St-Hilaire). Once again, Dieppe is at Mont St-Hilaire. Perhaps after his excursion to New York a week ago, he realized he wasn't quite ready for life on his own yet, and is intent on staying with the rest of his family for a while longer. Aug 16, 2001: 45.5N, 73.2W (St-Hilaire). Just like Pinnacle last fall, Dieppe has returned to Quebec after his first visit to New York state. Today he is right back at home at Mont St-Hilaire. Aug 12, 2001: 44.9N, 74.2W (Malone, New York). Dieppe has surprised us by undertaking a significant journey since his last report. He is now between Malone and Chateauguay in northern New York State, just to the north of Highway 11. This location is roughly 100 km to the southwest of Mont St-Hilaire. It will be interesting to see whether Dieppe returns home after this, or continues exploring instead. Aug 7, 2001: 45.4N, 73.1W (St-Hilaire). Today the first reports came in from Dieppe's satellite transmitter. There was a fair bit of variation in the locations indicated, perhaps somewhat distorted by the high heat and humidity, which can sometimes affect the quality of the transmitted signal. On average, he appeared to be staying near or perhaps a bit to the southeast of St-Hilaire; hopefully the next report will be a bit more clear to interpret. Aug 3, 2001: 45.6N, 73.2W (Mont St-Hilaire - Dieppe Cliff). Despite having never been in the presence of humans before (or perhaps because of that), Dieppe was exceptionally calm during the application of his transmitter. Upon his release, Dieppe made a strong flight, first looping out over town, then turning back and flying over our heads on the way back to the cliff. He was silent throughout this flight, but as he approached the cliff face, one of his siblings could be heard screeching a welcome. Capturing Dieppe took considerably more time and effort than any of the other peregrines involved in Project Track-'em this year, largely because of the difficulty of catching a wild bird on a cliff. We owe sincere thanks to the staff of the Centre de la Nature Mont St-Hilaire for supporting this undertaking and contributing some long hours to the project.